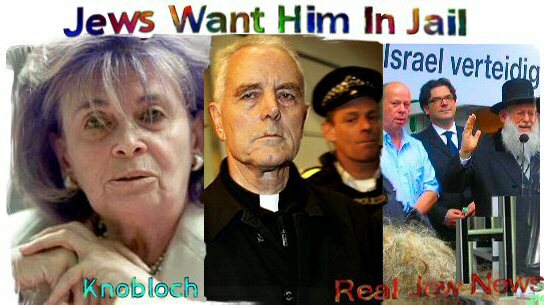 “JEWS ARE OUTRAGED OVER BISHOP WILLIAMSON’S APOLOGY,” reported the European Jewish Press (EJP) on March 11, 2009. “Outraged Jewish groups said Williamson had not retracted claims that no Jews perished in the gas chambers,” the EJP reported. “By refusing to retract his malicious lies in which he called into question the genocide of six million Jews, Williamson has again made it clear that he is a convinced anti-Semite. This is a rude, malicious and barbaric insult to all Holocaust victims and their descendants. Germany should now act within the framework of a European arrest warrant on Williamson.” View Entire Story Here. Many argue on behalf of Williamson, that his statement does not posit ‘holocaust denial,’ but rather, questions Jewish-inspired historical accounts regarding gas chambers being used in Nazi concentration camps. “Historical evidence is at issue, not emotions. As regards being labeled an ‘anti-Semite,’ St Paul stated that Jews are enemies of the Gospel. This is part of Church dogma and the Church cannot ‘recant’ on this issue. Anti-Semitism means many things today. For instance, when one criticizes the Israeli actions in the Gaza Strip, that person immediately becomes an ‘anti-Semite.’” View Entire Story Here. JEWS WISH TO PRESENT themselves as “martyrs.” This cannot be - simply because a “martyr” is defined as a “witness” - and Jews have no legitimate object that they bear witness to. This can be better understood in the context of Christian martyrdom. A Christian martyr is one who “bears witness” to Jesus Christ and His appearance in history. A Christian martyr is willing to die for this “witness” to Jesus Christ so as to benefit all mankind. But Jews only bear witness to their exclusivity as an elitist group by which they demand special treatment from the Gentiles. They do this for their own benefit and NOT for the benefit of all mankind. There is NO sacrifice involved… no universal truth suffered for… as in Christian martyrdom. 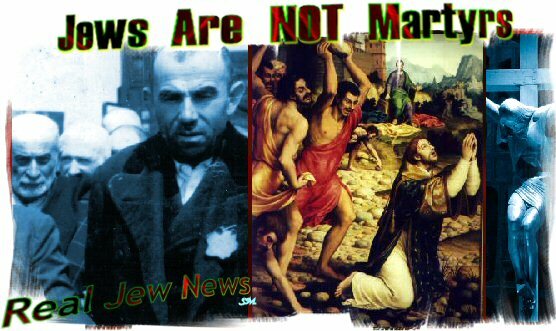 Thus Jews are NOT martyrs. And, Jews are NEVER innocent victims. Historical accounts have shown that the Jews of pre-WW II Germany and throughout Europe, (many of them being propagators of atheistic communism), brought on a German backlash. IN THEIR PROMOTION of the Holocaust, Jews are attempting to replace the central event of world history, namely, the death & resurrection of Christ, with their own version of “death & resurrection.” Jewry spins it like this: The Jews suffer a “death” in Nazi Germany. Then the Jews “resurrect” through the establishment of the state of Israel. But who cares? What positive impact has Israel had on the rest of humanity as the death & resurrection of Christ has conferred? To the contrary, the establishment of the state of Israel has created nothing but misery for the entire world ever since its inception. 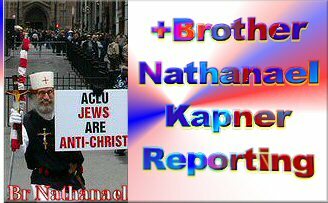 THE WORLD IS NOW BEGINNING to realize that Jews demand it their way and will not allow any dissenting opinion. And Jewry’s way is to establish themselves as the arbiters of what Gentiles both say and think.